It’s not in Jim Irwin’s nature to shy from challenges. The Buckhead native played center for Dartmouth College’s football team before returning home to lead the construction of Ponce City Market as senior vice president of Jamestown Properties. Then, still in his mid-thirties, he founded his own development company, New City, scooped up the prime estate where Atlanta’s infamous Murder Kroger operated, and launched the most expensive new construction project on the BeltLine to date—the $190-million 725 Ponce. 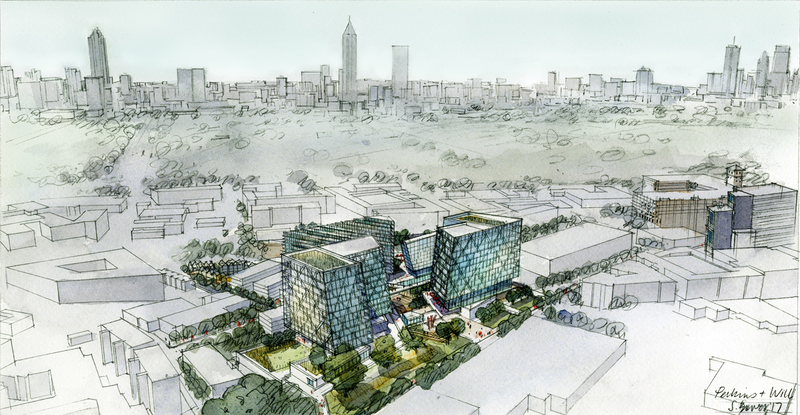 But what Irwin has planned for 10.2 acres about a block south of Ponce City Market is a whole new level of ambitious. Wedged between Historic Fourth Ward Park and the Atlanta BeltLine’s Eastside Trail, the site (tentatively called “760 Ralph McGill”) had been owned by Georgia Power for more than 50 years, used for staging and storing vehicles and materials. New City bought the property in October for $34 million, and Irwin recently unveiled the first renderings for what it could become: a $750-million, mixed-use hub of glassy, uniquely geometric architecture that incorporates terraced roofs, green elements, and elevated “flyover” bridges that would ferry walkers and cyclists from the BeltLine, through the project, and down into the park. How stiff was competition for a property like this? I’d say there were over two dozen initial proposals. That speaks to—from a developer’s standpoint—how strategic this location is. It’s one of the most important pieces of property in the City of Atlanta. It is literally juxtaposed between the BeltLine, the most vibrant public infrastructure project in the city—arguably, the country—and [Historic Fourth Ward Park], one of the most significant public investments in a park space that’s been made in the last 10 years. Our strategy is to use the property to seamlessly connect those two public assets in a way that’s exciting and involves some urban adventure. You’re just calling it 760 Ralph McGill for now? Yes. So much of development in Atlanta is about trying to name and brand things, and what I’m purposefully trying to avoid is naming it. The reason being: there are five or six discrete projects that will be part of this redevelopment effort. I want it to seamlessly blend into the Old Fourth Ward, to be a neighborhood asset, as opposed to a fortress of new construction that is called something specific. As part of the strategy, I’m actively soliciting proposals from five or six different architects, rather than one single architect, so that, again, it doesn’t feel like one project. It’s a big enough project that it’s really soliciting the interest of national and international [architecture firms]. Would you say these initial renderings are more of a placeholder, or do you imagine the finished project closely resembling them? I like to use watercolor renderings at this stage of the game to indicate broad intention, if that makes sense. What I want people to understand is we’re going to build projects that have spectacular, arresting, eye-catching, and awe-inspiring architecture. It’s intended to be something Atlanta hasn’t seen before. We’re trying to honor the topography of the park and the existing neighborhoods to respect appropriate densities. 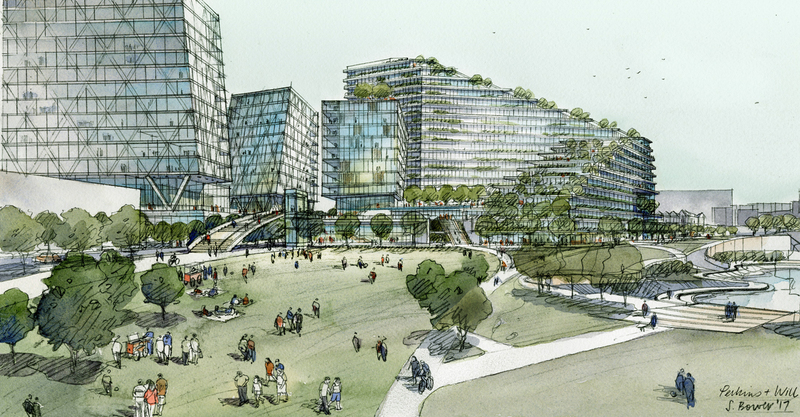 We’re not trying to build giant towers immediately up against this beautiful park. [On the opposite side] we’re trying to show Atlanta and the Southeast that the BeltLine can be not just a beautiful urban greenway, but a driver of urban renewal, densification, and a full-fledged transit corridor that drives job creation and economic development in Atlanta. Along those lines, how do you see this one day interacting with a BeltLine transit component? That’s one thing we’re explicitly working hand-in-hand with BeltLine staff [to achieve]—that our project will ultimately facilitate transit. Part of what we’re doing is building the infrastructure to support transit along the BeltLine in the near future. You mean from a functionality standpoint—not that you’ll be building train or streetcar platforms? Correct. If and when transit becomes a reality on the Eastside Trail corridor, what we build will support and facilitate it. We’re literally working with the BeltLine engineers to ensure that what we do complements and enhances transit. You’re planning 200,000 square feet of shops and restaurants eventually. Do you see some of that actually fronting the BeltLine? Absolutely. We want to build BeltLine-facing restaurants and retail that would sort of complement the uses. 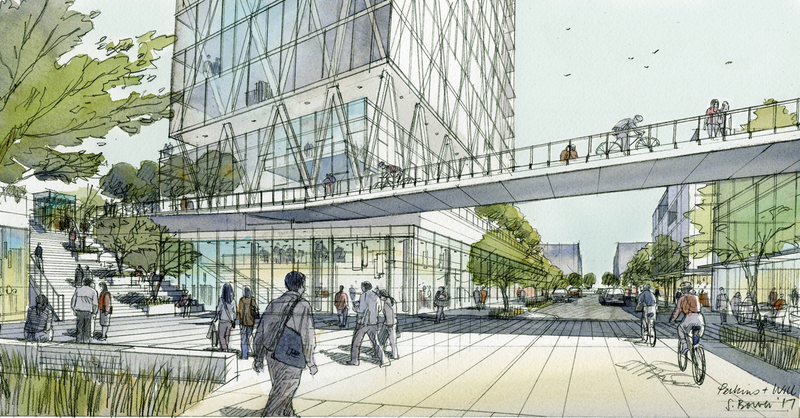 Elsewhere, there’ll be two 12-story office buildings and then a smaller, boutique hotel? Correct. The [height of] the office buildings would be in line with 725 Ponce. The vision behind the hotel is that if you look at major gateway cities—New York, San Francisco, Chicago—you find these “city clubs,” which are places where on weekdays, businesses can host conferences and events. Then on weekends there are restaurants and food services that support families. It’s somewhere between a traditional Atlanta athletic club and a neighborhood pool, if that makes sense. Our vision is to create a place here that’s really a neighborhood connector, in that it embodies the ethos of the neighborhood and brings together neighbors and local businesses. It would be a self-branded, very unique, bespoke location which also happens to have 50 to 75 [hotel] rooms to support it. And 700 residential units? Apartments or condos? It’s too early to say right now. I’d say we’re open to anything. Seven hundred units is a lot, almost three times what Ponce City Market has. Any plans at this point for affordable—or “workforce”—housing that would cater to folks not pulling six figures? One of things we’re well aware of is the inclusionary zoning legislation that was recently passed. I would just say we’re obviously fully prepared to honor that in our project. The rough cost of the project is $750 million. That alone speaks to the size of it, because that amount would have bought the construction of SunTrust Park (not including the Battery) with some change left over. Is financing—or the majority of it—in place at this point? I would say that it’s still at the very beginning of planning. From a financing perspective, we have a partnership that is absolutely, fundamentally committed to doing something that is incredibly special for our city. And then each discrete project in the future, once we get to that point, will seek its own debt before we begin construction. Along those lines, have you spoken with any potential tenants? Or is it too early for that? It’s way, way too early for that. We’re just interviewing architects at this point. So you haven’t been firing off emails to Amazon yet? I don’t think it would fit, what Amazon needs [for HQ2]. Or maybe it would? Okay, so the zoning and permitting process is months down the line? We’re actually just beginning the zoning process, and so far, so good. We’re working closely with neighborhood leadership and city leaders, and everyone’s been supportive so far. We hope to break ground on the first component of the project by 2019. It won’t be any sooner than October  or later than March next year. What’s the rough timeline to have the whole thing completed? It’s impossible to say, but if you look at our reasonable timeline, I’d say six years. You’ll start to see the first things come online in the next two years. There’s been talk that this recent gangbusters development cycle would start to peter out soon in Atlanta, but that’s been the talk for years. With a project of this scope, a development slow-down doesn’t seem like a theory you’re buying in to? I think that’s correct, but I would also add that what we’re doing is explicitly trying to transcend the cyclical nature of real estate. We’re trying to build projects that are relevant for 30-plus years. It’s a bit of a different way to approach projects like this. 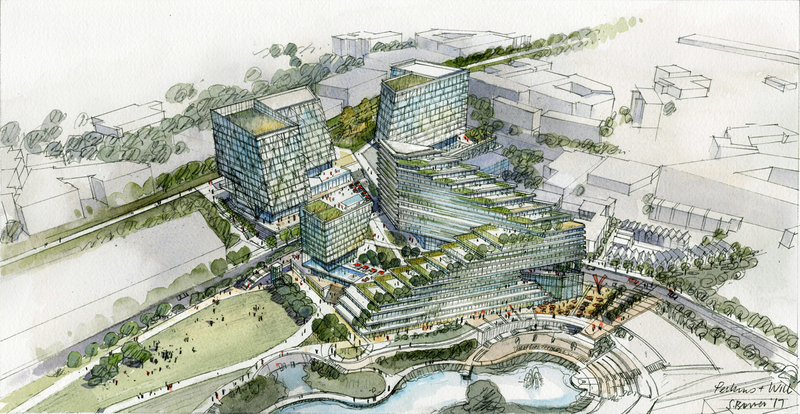 Lastly, you’ve spoken of trying to elevate architecture in Atlanta, your hometown. What we’re discussing here sounds like one heck of palette for doing that.